• High sensitivity and wide linear range. Linear detection range (10 μL sample): 1 to 100 U/L. • Homogeneous and simple procedure. 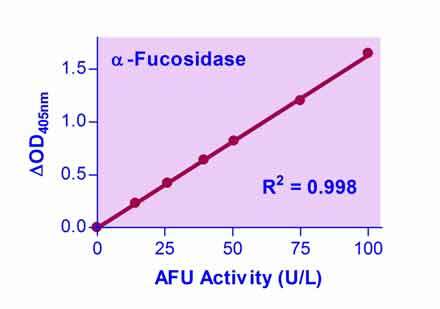 Simple add-mix-read procedure allows reliable quantitation of fucosidase activity within 20 minutes. • Robust and amenable to HTS. All reagents are compatible with high-throughput liquid handling instruments. Can be readily automated to measure thousands of samples per day. • Plasma, serum, tissue, cell lysate, etc. • α-L-FUCOSIDASE (AFU) is an enzyme coded by the FUCA1 gene in humans and catalyzes the breakdown of L-Fucose. A genetic deficiency in this enzyme results in a neurovisceral storage disease, fucosidosis, which is characterized by the accumulation of fucose. Low serum activity of fucosidase has also been linked to ovarian caricinoma. Elevated fucosidase serum activity has been observed in patients with diabetes, hyperthyroidism, cirrhosis, and hepatitis. Increased activity has been associated with lung, breast, stomach, ovary, uterus, and liver carcinomas. BioAssay Systems non-radioactive, colorimetric AFU assay is based on the cleavage of 4-nitrophenol from the synthetic substrate. Nitrophenol becomes intensely colored after addition of the stop reagent. The increase in absorbance at 405 nm after addition of the stop reagent is directly proportional to the enzyme activity.